I live in the south suburbs of Illinois, but just a stone's throw from the Indiana border - and Lake County, Indiana. 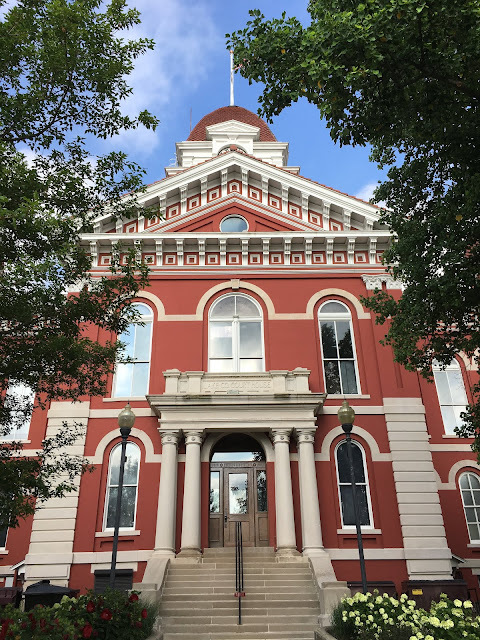 In south Lake County in the city of Crown Point sits the "Grand Old Lady," the old 1878 courthouse that is surrounded by a traditional town square. It's an absolutely stunning structure that wasn't always so stunning. A few decades back it was falling into disrepair and slated to be demolished. I'm so glad that those plans didn't happen and that it was restored. It was added to the National Register of Historic Places in 1973. The building was constructed at a cost of $52,000 and dedicated in 1880. Today, the building houses the courthouse shops, Lake County Historical Society and a ballroom that can be rented for special events. A friend of ours was married there and it was a beautiful reception. 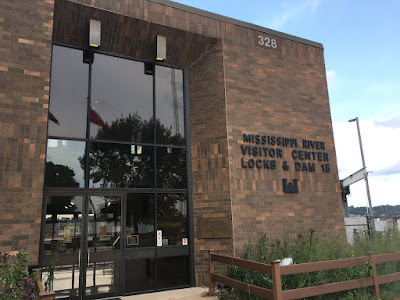 If you're looking for free attractions in the Quad Cities, one of the coolest is the Rock Island Arsenal, where you can take a in a lot of history, get some great views of the Mississippi River and learn quite about about the history of the military and the area. While at Rock Island Arsenal, take time for a visit to the Mississippi River Visitor Center where you can see Lock & Dam 15, the largest roller dam in the world. Once in the doors, you head up to the second floor where you can look out at the damn from a long wall of windows or from an outside observation deck. On the day we visited we were able to see a barge move through the locks with the bridge slowly moving on a 45 degree angle to allow it pass through. I felt a tinge of sympathy for all the cars backed up along the bridge and beyond sitting and waiting to get to the other side. Earlier this year my dad relocated to central Illinois to live with my sister. It's been a hard adjustment. I'm a big Daddy's girl and with him living just five minutes away before the move, we would often get together for lunch - and usually talk baseball since we are both huge Chicago Cubs fans. We both immediately missed our lunch dates and so we've been getting together about once a month. Dwight is about the halfway point from my home in Chicago's south suburbs and his place in Mackinaw, which is between Peoria and Bloomington. For out last couple of lunch outings, we met at the Old Route 66 Family Diner, which is at exit 217 right off of I-55. Across the street from the diner is the Route 66 Visitor Center. My husband and I decided to plan a little day date one day while the kids were in school, so we went out to lunch at a brewpub and then followed it up with a drive out to Morocco, Indiana in search of bison. 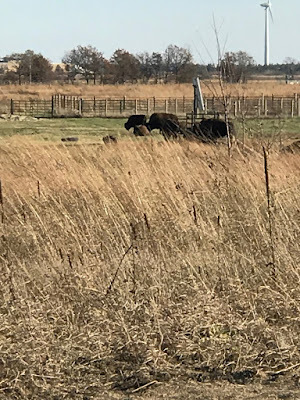 On a preserve that is in the process of being restored as much as possible to its original state, bison have been placed and hundreds of acres now have native plants and prairie grass. Last year in December we decided to return to Shipshewana the week following Christmas. 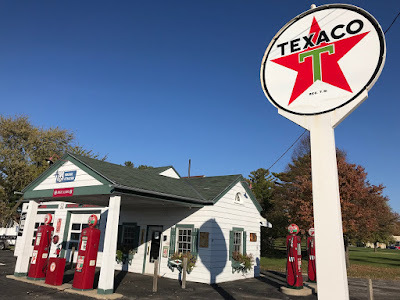 We had visited the area a couple years earlier and Shipshewana is lovely at Christmastime, especially when there is a blanket of snow on the ground among the twinkling lights in town and the horses galloping along the roads. 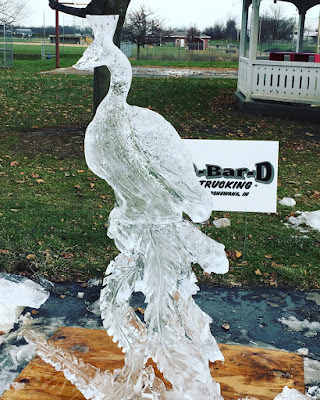 We also picked this time of year for a visit because I had noticed there was an ice festival there. It was a few days after Christmas and I love to travel during that time - when the hustle and bustle of the holiday is behind you, but the Christmas spirit is still alive and everything is decorated in festive holiday beauty.